The body is about 60% water, give or take. We’re constantly losing water from our bodies, primarily via urine and sweat. 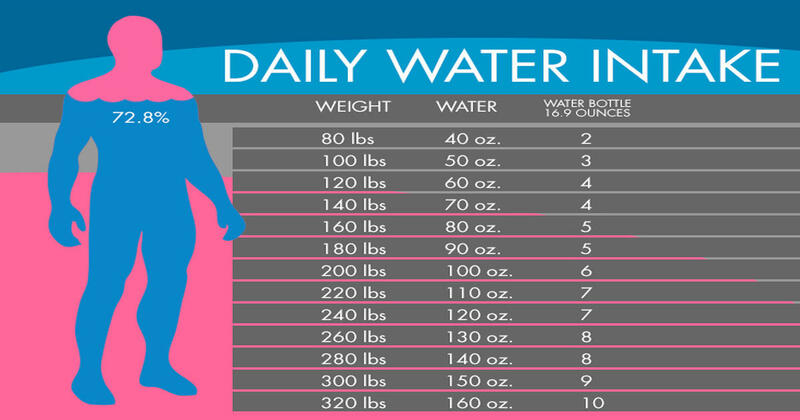 How much water should you drink each day? It’s a simple question with no easy answers. Studies have produced varying recommendations over the years, but in truth, your water needs depend on many factors, including your health, how active you are and where you live. Although no single formula fits everyone, knowing more about your body’s need for fluids will help you estimate how much water to drink each day. There are many different opinions on how much water we should be drinking every day. The health authorities commonly recommend eight 8-ounce glasses, which equals about 2 litters, or half a gallon. This is called the 8×8 rule and is very easy to remember. However, there are other health gurus who think we’re always on the brink of dehydration and that we need to sip on water constantly throughout the day… even when we’re not thirsty. As with most things, this depends on the individual and there are many factors (both internal and external) that ultimately affect our need for water. The easiest way to know if you’re drinking enough fluid is to look at the color of your urine. If you’re drinking enough water, your urine will be clear or pale yellow. A darker yellow means you aren’t drinking enough water.People who drink enough water also usually have soft bowel movements. Hard bowel movements or constipation can be signs that you aren’t getting enough water.